Digital Art vs Hand Drawn? I have recently gotten into drawing manga and want to share my art with others. The problem is, it's hand-drawn, and I don't know how I can share it, because taking a pic with my phone would look kind of weird. And also, I've noticed that digital art is much cleaner and easier, but I don't know how people can draw with a mouse let alone myself, or if they even use a mouse. I could draw on an iPad, but I don't have one. Help? 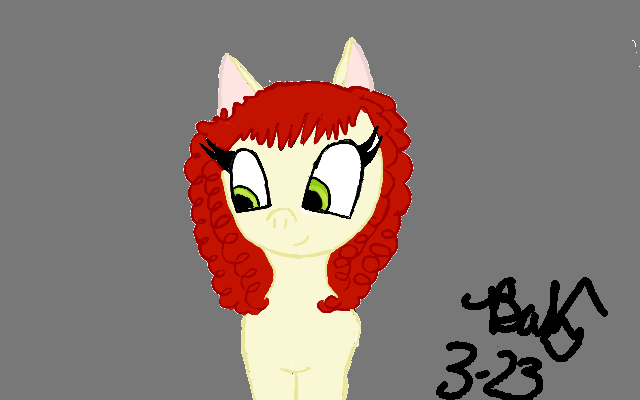 like forever ago, but I made this in MS paint, me as a my little pony because I was really, REALLY bored. Depending on hat computer/program you have and are good at will affect your art's cleanness. Windows ten has a sketchpad that makes really clean lines, but I haven't played with it much. GIMP is a free photoshop-esque program complete with brushes, line tools, layering and highlight tools. I usually use that to color. As for doing traditional art, scanners my friend. or if they even use a mouse. Do you have acess to a scanner? Thanks, I'll look in to a tablet, and yes I do have a scanner on my printer, I'm assuming that I should scan my art thank you! Yeah, scannung should be better than taking a picture with your phone.